Conditions were desperate at the Louisiana Superdome on Thursday. NEW ORLEANS, Louisiana (CNN) -- Diverging views of a crumbling New Orleans emerged Thursday, with statements by some federal officials in contradiction with grittier, more desperate views from the streets. By late Friday response to those stranded in the city was more visible. CNN Producer Kim Segal: It was chaos. There was nobody there, nobody in charge. And there was nobody giving even water. The children, you should see them, they're all just in tears. There are sick people. We saw... people who are dying in front of you. Evacuee Raymond Cooper: Sir, you've got about 3,000 people here in this -- in the Convention Center right now. They're hungry. Don't have any food. 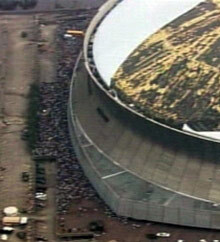 We were told two-and-a-half days ago to make our way to the Superdome or the Convention Center by our mayor. And which when we got here, was no one to tell us what to do, no one to direct us, no authority figure. Brown: That's not been reported to me, so I'm not going to comment. Until I actually get a report from my teams that say, "We have bodies located here or there," I'm just not going to speculate. Evacuee Cooper: They had a couple of policemen out here, sir, about six or seven policemen told me directly, when I went to tell them, hey, man, you got bodies in there. You got two old ladies that just passed, just had died, people dragging the bodies into little corners. One guy -- that's how I found out. The guy had actually, hey, man, anybody sleeping over here? I'm like, no. He dragged two bodies in there. Now you just -- I just found out there was a lady and an old man, the lady went to nudge him. He's dead. Brown: I've just learned today that we ... are in the process of completing the evacuations of the hospitals, that those are going very well. Brown: I've had no reports of unrest, if the connotation of the word unrest means that people are beginning to riot, or you know, they're banging on walls and screaming and hollering or burning tires or whatever. I've had no reports of that. Brown: Considering the dire circumstances that we have in New Orleans, virtually a city that has been destroyed, things are going relatively well. Homeland Security Director Chertoff: Now, of course, a critical element of what we're doing is the process of evacuation and securing New Orleans and other areas that are afflicted. And here the Department of Defense has performed magnificently, as has the National Guard, in bringing enormous resources and capabilities to bear in the areas that are suffering. Crowd chanting outside the Convention Center: We want help. Nagin: They don't have a clue what's going on down there. Phyllis Petrich, a tourist stranded at the Ritz-Carlton: They are invisible. We have no idea where they are. We hear bits and pieces that the National Guard is around, but where? We have not seen them. We have not seen FEMA officials. We have seen no one. Chertoff: In addition to local law enforcement, we have 2,800 National Guard in New Orleans as we speak today. One thousand four hundred additional National Guard military police trained soldiers will be arriving every day: 1,400 today, 1,400 tomorrow and 1,400 the next day. Nagin: I continue to hear that troops are on the way, but we are still protecting the city with only 1,500 New Orleans police officers, an additional 300 law enforcement personnel, 250 National Guard troops, and other military personnel who are primarily focused on evacuation. Lawrence: The police are very, very tense right now. They're literally riding around, full assault weapons, full tactical gear, in pickup trucks. Five, six, seven, eight officers. It is a very tense situation here.